BEACH DREAM HOME! SPACIOUS & UPDATED 2 BED/ 2 BA UNIT w OCEAN-VIEWS, CUSTOM KITCHEN, CERAMIC & WOOD FLOORS, TILED MASTER BATH w DUAL SINKS & GLASS ENCLOSED WALK-IN SHOWER. ENJOY THE LIGHT-FILLED OPEN LIVING AREA, OCEAN BREEZE PATIO, SPLIT BEDROOMS w AMPLE STORAGE, WASHER/DRYER & BONUS DINING/OFFICE SPACE. QUIET BOUTIQUE BUILDING (46 UNITS) w PVT ACCESS TO WIDE BEACH & SEASIDE HEATED POOL. VACATION AT HOME! CLOSE TO RESORTS, PIER & RESTAURANTS. GARAGE PARKING, PET FRIENDLY, LEASE 1st YEAR. Condo with 2 bed / 2 bath split floor plan. Master with en suite. Walk-in closets, eat-in kitchen, dining room, utility room with W/D. Wall-to-wall sliding glass doors across living room and kitchen leading to large private balcony with a peek-a-boo ocean view. Building is oceanfront & pet friendly with parking garage, club room, gym, billiards, and an outdoor pool with a view of the lighthouse. 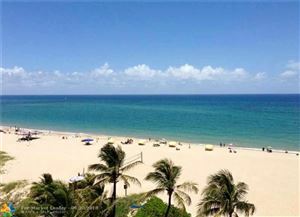 Walk to inlet, Pompano Pier, restaurants, shops, & events. Excellent investment opportunity. 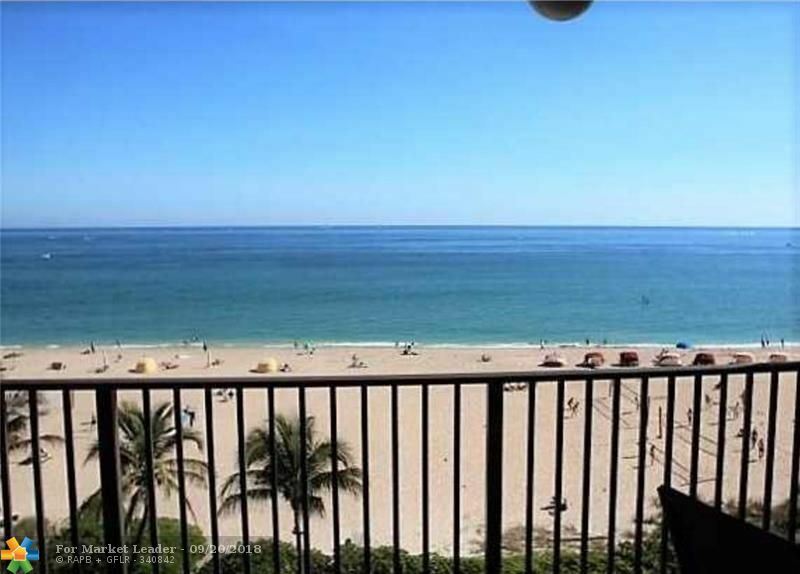 TURN-KEY FURNISHED & FULLY REMODELED CONDO ON THE SAND! GORGOUS DIRECT EAST OCEAN VIEWS WITH POSTCARD VIEWS OF LIGHTHOUSE. GENEROUS 3B/2b OPEN FLOOR PLAN WITH GRANITE KITCHEN AND BALCONY OVERLOOKING DEEP BEACH. WASHER/DRYER, IMPACT GLASS, 1 COVERED PARKING SPACE, BIKE STORAGE AND A STORAGE POD. QUIET AND SECURED BOUTIQUE CONDO WITH POOL/SPA/GYM/SAUNA AND MORE! CLOSE TO GREGG NORMAN PUBLIC GOLF COURSE, WHOLEFOODS, SHOOPING MALL. ALSO OFFERED AS A SHORT TERM RENTAL AT $4,500 PER MONTH, MINIMUN 4 MONTHS. 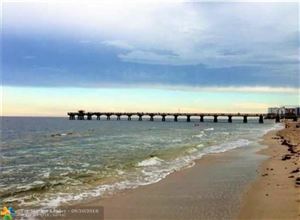 SPACIOUS AND FULLY REMODELED CONDO ON THE SAND! DIRECT EAST OCEAN EXPOSURE WITH GORGEOUS POSTCARD VIEWS OF LIGHTHOUSE. GENEROUS 3 BEDROOM/2BATHROOM OPEN FLOOR PLAN WITH GRANITE KITCHEN AND LONG BALCONY OVERLOOKING DEEP BEACH. FULL SIZE WASHER/DRYER, IMPACT GLASS, 1 COVERED PARKING SPACE AND THE POSSIBILITY FOR A SECOND ONE, PLENTY OF GUEST PARKING, PLUS A BIKE STORAGE AND A STORAGE POD. QUIET AND SECURED BOUTIQUE BUILDING WITH POOL/GYM/SAUNA AND MORE! CLOSE TO GREGG NORMAN PUBLIC GOLF COURSE, WHOLEFOODS, SHOOPING MALL. PERFECT FOR THOSE DOWNSIZING FROM A SINGLE FAMILY HOME AND LOOKING FOR A BEACH-SIDE LIFE STYLE. ALSO OFFERED FULLY FURNISHED AT $3,750.